Abraham A. Wolfe, ca. 1895. Source: Preservings Photo. Abraham A. Wolfe: teacher, printer and medical doctor; born 17 June 1876 in Manitoba to Abram and Eva (Klassen) Wolfe, as the fifth of nine children. Abraham was baptized on 3 June 1895, and he married Sara Fehr (1880-1946) on 31 July 1898. The couple had 11 children, six of whom died young. Abraham died on 4 March 1945 in Plum Coulee, Manitoba. 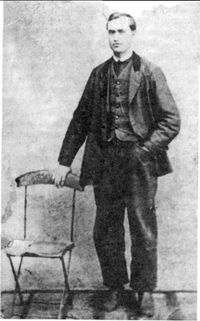 Abraham A. Wolfe was the first surviving child of immigrants from Russia; three of his siblings died in Russia, while another three died after him. Only Abraham and his brother, Johann, survived. In his youth, Abraham worked extensively with steam engines until an accident with a threshing machine cost him his left arm. On 23 July 1898, Abraham married Sara Fehr, the daughter of Isaak and Sara (Neufeld) Fehr of Hoffnungsfeld, West Reserve, Manitoba. The couple lived in Gnadenthal, West Reserve, for some time after their marriage. Abraham was unable to farm because of his injury, but he used his gifts in other areas. He had served as a Vorsänger (song leader) in the local church and after his accident, he began a career in teaching, working in Blumenort, Osterwick, Rosengart, Reinfeld, and other communities. In addition, he had a printing press in Plum Coulee, Manitoba, the Mennonite Publishing House, where he printed school materials, books and booklets. Devotional literature and historical documents were only some of the documents Abraham printed for himself and the community. Abraham also had many other interests, and he received medical training while still working as a teacher and printer. He was an inventor, and the washing machines he constructed became very popular. In the years after the First World War, Abraham A. Wolfe and his family decided to leave Canada, together with many other Mennonites. Abraham served as leader for a group of immigrants to Mexico in 1922, and the Wolfe family settled in Cuauhtemoc together with many of the other Mennonites. He lost all of his savings after the bank where he had deposited his money went bankrupt, but he soon began to earn a living from his medical work. He built a clinic on his son’s property and began to treat Mennonites and local Mexicans, also travelling through the mountains to treat the sick in their homes. When the family moved to Namiquipa, Abraham continued the work he had started in Cuauhtemoc. Abraham A. Wolfe’s years in Mexico ended in June 1935, when the family decided to return to Manitoba because of the unrest and violence in Mexico. Together with his wife, several of their children, and other relatives, Abraham embarked on the month-long trip across the United States back to Canada. Back in Manitoba, Abraham continued his printing work for some time until Sara became virtually bedridden because of severe arthritis. Abraham gave up his printing business to look after his wife, and the two moved to a house on their son’s yard. Abraham suffered a stroke and, after a short hospital stay, died on 4 March 1945 in Plum Coulee, Manitoba. Sara died over a year later, on 14 July 1946, in Winnipeg. Abraham A. Wolfe was an inventive, generous man whose troubles never kept him from giving to others or from embarking on new adventures. Throughout all the changes in his life, he remained dedicated to his family and his community. GRANDMA (The Genealogical Registry and Database of Mennonite Ancestry) Database, 5.03 ed. Fresno, CA: California Mennonite Historical Society, 2007: #182794. Plett, Delbert F. “Abraham A. Wolfe, 1876-1945.” Preservings No. 17 (December 2000): 48-52. Huebert, Susan. "Wolfe, Abraham A. (1876-1945)." Global Anabaptist Mennonite Encyclopedia Online. December 2007. Web. 26 Apr 2019. http://gameo.org/index.php?title=Wolfe,_Abraham_A._(1876-1945)&oldid=123255. Huebert, Susan. (December 2007). Wolfe, Abraham A. (1876-1945). Global Anabaptist Mennonite Encyclopedia Online. Retrieved 26 April 2019, from http://gameo.org/index.php?title=Wolfe,_Abraham_A._(1876-1945)&oldid=123255. This page was last modified on 24 June 2014, at 07:08.